On February 5, 2018 the City of Beaumont submitted two Bond Requisitions to the new Bond Trustee, Wilmington Trust, requesting that $2,872.46 transferred from the 2017-2 Bond and $599,596.77 from the 2017-3 Bond. The Requisitions give direction to the Trustee to transfer the money directly to Pardee Homes, but no Invoices are included in the backup, only a letter from the City claiming that the Infrastructure was completed. 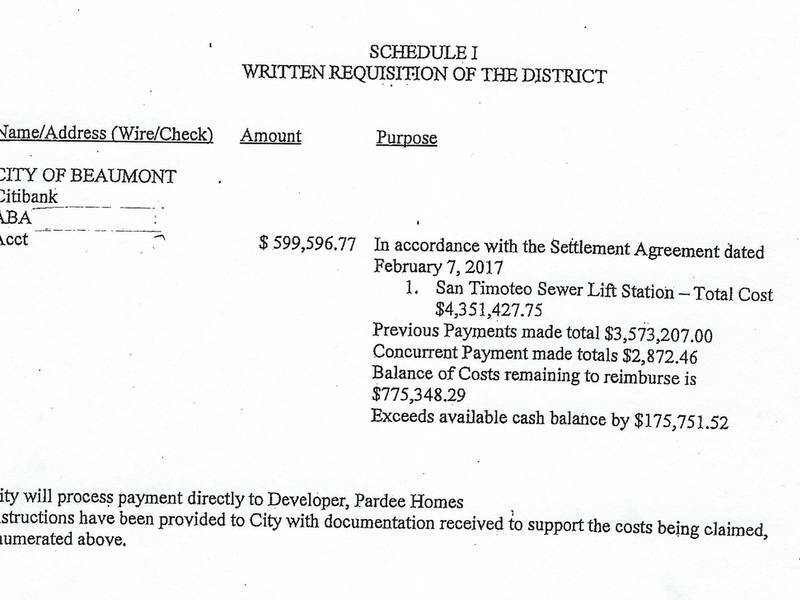 Was Pardee Homes twice; once through the Bond Fund Accounts AND again directly by the City? Nobody knows because the City lies about everything. The $602,469.23 payout from the Bond Fund Accounts was never approved by the City Council and past Public Records’ Request for Bond Requisitions were returned stating “No Documents Exist”.